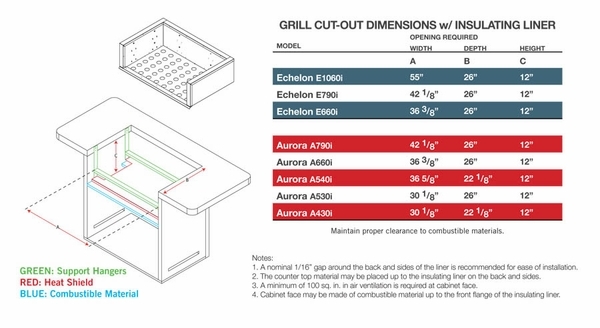 When you decide to build a permanent outdoor kitchen with beautiful cabinetry and storage for grilling utensils and cookware, a requirement for grills constructed in any type of combustible material, such as wood, is installing an insulated liner first. This easy to install and durable stainless steel insulated liner is a must to keep your beautiful cabinetry and grilling station safe from heat and fire. Just take your measurements and select the right liner for your outdoor kitchen and you will on your way to creating wonderful meals for your family and friends to enjoy. * Please Note: Cutout and dimension specifications are located on Page Six of Manual 2 below.